Chloé Morgan born in London, England, is an entertainer to the core; singing, acting, dancing and playing musical instruments (piano and violin) from 5 years of age. Music and entertainment has always been her passion. As a youth, Chloé was awarded a scholarship to acclaimed "London Studios Centre" performing arts school, which cultivated and sculpted her passion giving her talent a strong foundation. Through her ambition and drive and insatiable desire to share her gift with the world came many opportunities. One of which was the hit British reality show, Popstars: The Rivals. From her experience and exposure on the show, the contacts she made led to her signing a major record deal as part of girl group "Clea" with industry powerhouse Warner Brothers. The group toured the UK as supporting act to "Daniel Beddingfield" and boy band "Blue" and performed on many radio and television programs. Chloé acquired the skills she needed to take her to the next level, and decided to pursue a solo career. Travelling internationally, performing, recording and songwriting in the studio. Chloé has a musical backbone that has been recognized with some of the most renowned names in the industry such as the family of Chaka Khan and old MoTown pros, who she had the opportunity to work with in the studio as a singer/songwriter. 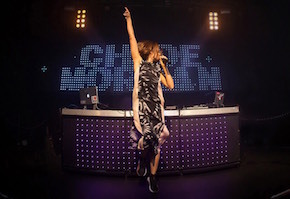 Chloé decided to expand her skills, where she trained in the UK as a DJ, working the club circuits in Essex and London and was part of DJ team’s world famous "Hillsong London". Chloé is currently living in Vancouver, Canada where her career took off as a high profile DJ and singer in the city. Working on her own original music in the studio and travelling between Canada, America, Europe and the UK. Chloé has introduced and branded a new unique style as a DJ into the industry, merging her live vocals & instrumentation into her DJ sets with genres from Dance, House, Funk, Soul, R&B, Hip Hop, Old School and her own original music. Creating something truly extraordinary and original, giving her audience an unparalleled music experience. Chloé Morgan is available for voiceover work and her original music is available for licensing for Film, TV, Commercials etc.